Welcome to our new Developer Diaries Series, where we highlight the incredible innovations in the Magento Marketplace and the people who make them a reality. Commerce innovation runs in Max Pronko’s veins. As a long-time member of the Magento community, he’s known for sharing his knowledge and experience with developers via conferences, his popular blog, and videos. We sat down with Max to discuss the meaning of the community, his experiences as a payments integration developer for Magento Marketplace, and a surprising move he made during Imagine 2017. Magento: You have been a well-known member of the Magento Community for some time. Tell us how you first got involved. Max: I started programming in 2003 and attended my first Magento hackathon in 2013. Since then, my life has changed completely. I had not planned on joining any community, but was surprised by Magento’s openness and friendliness. When I started going to more conferences and events, I realized the community is about relationships. These people aren’t just friends, it’s not just a company. It’s a family. I actually ended up joining the company as a developer between 2010 and 2015. Today, I run the Magento 2 implementation at The Irish Store as Chief Technical Officer. On the side, my Magento 2 Blog covers technical tutorials on how to solve problems faster. Magento: What was the response when you launched your Magento Commerce 2 blog? Max: Very positive. I wasn’t expecting that much attention. At first, I was just looking for a way to express myself while exploring some development. But people are interested in what I have to say and are always looking for examples and guidance. I noticed at once that not only developers read my blog, but also CEOs and CTOs—non-technical people who are interested in Magento as an eCommerce platform. I started to share more information from a usability point of view—topics like best practices, business problems Magento Commerce solves, how to select the right solution provider for Magento Commerce 2, and motivational messages about making eCommerce better. Magento: What is DevChannel and your favorite video on it so far? Max: Developers always want to know more about Magento Commerce 2. I love writing articles for my blog but realized that, sometimes, it is much better to not only give a piece of advice, but to present it visually. So I created a Magento DevChannel to host tutorials on individual platform features, but the best video so far is from Imagine 2017. Since I am all about the community, I asked people on Twitter what I should do if my company won an Imagine Excellence Award. 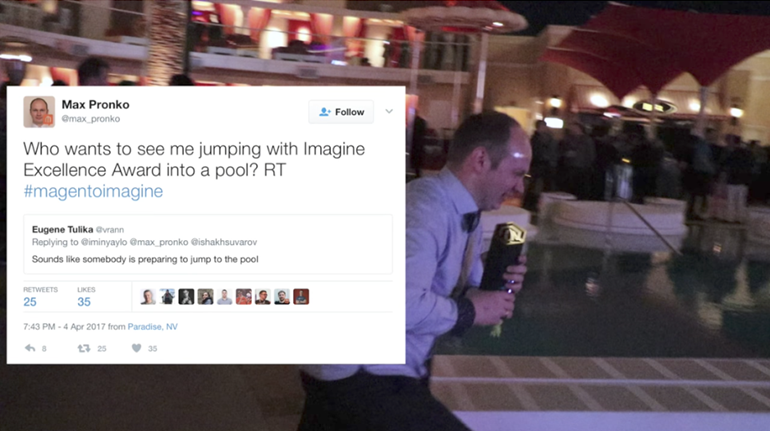 After we had won Best Magento 1 to Magento 2 Migration, I jumped into the pool with the award in my hands. Magento: Tell us about your Marketplace extensions: Realex Payments, Elavon Payment, and PagSeguro Payment. Max: When Magento Commerce 2 was launched, I knew it was the future. I decided to start building extensions, in part because I wanted my blog to feature a piece of practical advice based on firsthand experience with Magento Commerce 2. Payments are one of the most important parts of eCommerce. The customer experience must be smooth and secure. However, every market involves a different set of requirements, from a dynamic currency conversion to compliance regulations of payment methods using credit and debit cards or Apple Pay. That’s where my extensions come in. Realex Payments integration is for the United Kingdom and Europe, Elavon Payment works for the United States, PagSeguro Payment is for the Brazilian market. Moreover, I’m working on other payment integrations that will be announced in the nearest future. Magento: What are some Magento Marketplace extensions you recommend to merchants? Max: Before I recommend any extension, on my blog or other social channels, I personally review it for usability and technical quality. The extension cannot fail or break something else when you update your software. Recently I have reviewed Rich Snippets by Atwix, which helps merchants make their content more visible in search engine results. The extension is built according to the best practices for the Magento Commerce platform and a software architecture in general. I also recommend Print Order PDF from Fooman, which simplifies administrative processes. Merchants can easily create and print confirmation PDF documents for online purchases, including bulk orders. Magento: What advice do you have for others who want to innovate in commerce? Max: Any person with an idea that they believe in should implement it. Don’t be scared and don’t listen to negative opinions and feedback. Build something smart you believe in. If you fail, you will learn some lessons. Eventually, you’ll come up with another idea that will succeed. Whether it’s something in commerce, an artificial intelligence, or simply an innovation that improves a process or saves time, you could change someone’s life or change the entire world.